Ruth (Hebrew: רות, Rūth; Greek: Ῥούθ, Rhouth; Latin: Ruth; "Name means::friend") (m. Married::2682 AM, Married::Tammuz 2692 AM) was a Moabitish woman who married two Israelites and became an ancestress of ancestor of::Jesus Christ. Her story is one of great faith, demonstrated almost flawlessly. The Bible says nothing of the prior history of Ruth, other than that she was a descendant of Moab. Many commentators have suggested that she was a princess of the royal house of Moab, perhaps a daughter of King Eglon. But her willingness to leave her family behind and move to a foreign land, and her modest conduct while in that land, are not consistent with a royal origin. She seems to have been a bashful and self-effacing young woman, accustomed, or at least adaptable, to asking for grace rather than demanding her just due, whatever she might have thought that might be. How she came to marry a foreign resident, the Bible does not say. In 2682 AM, she married Mahlon, son of Elimelech, a relatively prominent man who had come to Moab from Bethlehem in Israel on account of a severe famine in that country. Elimelech had recently died and left two sons. Mahlon was one; the other was Chilion, who married a fellow countrywoman of Ruth's named Orpah. Ruth was married to Mahlon for ten years, but had no children. In 2692, Mahlon and Chilion both died. Now Naomi, Elimelech's widow, said that she had heard that the famine in Israel was over, and she planned to return there. She told Ruth and Orpah that they should each return to her mother's house, but they declined and said that they would rather follow her. After they had traveled part of the way, Naomi told the two women again that they ought to return. She added that she was not likely to find another husband, and therefore Ruth and Orpah would not likely have any other men to marry in order to secure for them a portion of Elimelech's estate, as would otherwise be their right under the levirate law. Orpah finally said goodbye and returned to her mother's house. But Ruth clung to Naomi and begged her not to send her back. She then made a thorough profession of faith: that she would go where Naomi went and sleep where Naomi slept, regard the Israelites as her own people and worship the God of Israel, and even die and be buried in Israel. Naomi stopped arguing and allowed Ruth to accompany her to her home town of Bethlehem. The people in Bethlehem knew Naomi well. 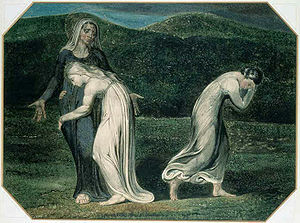 But Naomi now asked the townsfolk not to call her Naomi any more, but to call her Mara (literally, bitter), because God had treated her bitterly. 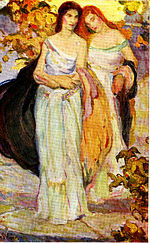 Ruth and Naomi arrived in Bethlehem on or about 1 Abib 2692 AM, the beginning of the month of barley harvest. Ruth seems to have held no illusions about her status in Israel. She and Naomi were destitute, with no assets other than an estate that they could not manage and would probably have to sell. But Ruth familiarized herself with all the laws that the Israelites lived under, including those that made provision for the poor. This included the gleaning law. So Ruth "happened" to come onto the property of Boaz, and Boaz "happened" to come to survey his land and confer with his harvesters on that very day. Boaz was as pious as he was wealthy; he greeted his harvesters by saying, "May the Lord be with you," and they answered him in kind. Boaz noticed her almost at once and asked about her. His foreman told Boaz that Ruth had asked permission to glean in his field, and had been working since the early morning, except that she took a brief rest in the farmhouse. Now Boaz made her welcome, and in a manner that far exceeded his duty under the gleaning law. First he enjoined her specifically from gleaning elsewhere, and declared that she would be under his personal protection from molestation or any other insult. (One commentator describes this protection as "the first anti-sexual-harassment policy" on record.) Next he permitted her to drink from the workers' water supply and even to lunch with the women who participated in the harvest. 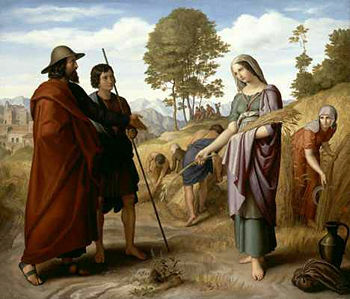 He instructed his harvesters to allow her to glean among the bound sheaves and even to pull some grain out of the sheaves and drop it on the ground for her to pick up. Finally, he told her to feel free to glean during the entire harvest season. Ruth prostrated herself before Boaz and asked him why he should do her such favors, when she was a foreigner. He replied that he respected her because she had come to a foreign land and had done everything possible to support Naomi after Mahlon had died. At the end of that first day, Ruth gleaned an ephah (roughly an English bushel) of barley. She brought it to Naomi, who asked where she had been able to glean so much. When Ruth mentioned the name of Boaz, Naomi said that she recognized the name as that of a close relative of Elimelech, and one who perhaps could redeem Elimelech's impoverished estate. 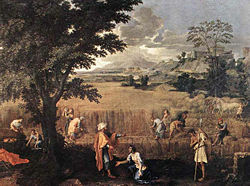 The ga'al must buy the estate in order to keep the land within the family. If the decedent left a widow, the ga'al must marry the widow, and their first-born son would inherit the estate and preserve the name of the deceased. The latter duty was an extension of the levirate law, which stated that a widow had the right to marry her late husband's brother, if he had one. Mahlon and his brother were dead, but if levirate marriage were impossible, the ga'al could still intervene. Naomi identified Boaz as the qualified ga'al. He was probably Elimelech's great-uncle. On the last night of the wheat harvest, Boaz would be winnowing his barley at the threshing floor (a special area of land reserved for winnowing). Naomi instructed Ruth to wash and anoint herself, dress herself in her most attractive attire, and go to the threshing floor secretly. Boaz would lie down next to a pile of barley, and Ruth was to uncover his feet and lie down beside him. He would then tell her what to do. Ruth did not argue; she told Naomi that whatever she said to do, Ruth would do. Ruth then did exactly as Naomi had told her, but she did not attempt anything so crude or forward as a romantic advance. Instead she uncovered Boaz' feet without disturbing him and then lay down at his feet. In that posture, she still preserved the same distance between herself, as a suppliant, and the generous property owner who had been her source of sustenance for three months. Later that night, Boaz awoke with a start and discovered a young woman lying at his feet. Surprised, he asked, "Who are you?" Ruth identified herself and made a frank proposal of marriage. She asked Boaz to spread his skirt over her (a Hebrew idiom for marriage), as was his duty to her as the ga'al. Though Boaz might have been obliged to do as Ruth was asking, Ruth was not obliged to make such a proposal. She could have sought a man much nearer her own age to marry. (Boaz was probably 124 years old at this time.) She had made this offer on account of Naomi, and Boaz recognized this and thanked her profusely. Boaz then told her that in fact Elimelech had another, closer living relative than he. Boaz proposed to ask this other relative in the morning whether he was willing to act as the ga'al. If he was not, then Boaz was. True to his word, Boaz spoke to the other man in front of ten witnesses about Elimelech's estate, and made clear that part of acting as redeemer would include marrying Elimelech's daughter-in-law. The other man then declined and renounced his rights in the matter. To signify this, he drew off his sandal, thus observing a custom similar to that described above for a brother refusing a levirate marriage. The Bible does not say that Boaz spat in the man's face, but only that he accepted the sandal and announced his intention to redeem Elimelech's estate and marry Ruth. 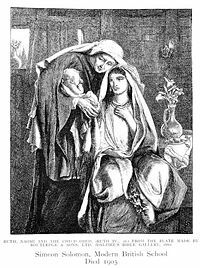 Naomi nursed Obed, who later became the grandfather of King David. 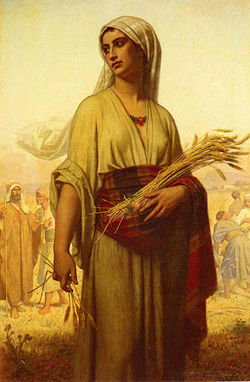 The story of Ruth is a prominent instance of typology in the Bible. All of the major and supporting characters are types of other persons or groups of persons. Boaz is generous, is attentive to the needs of the poor, rewards Ruth for her loving service to Naomi, and finally plays the role of a redeemer. He is a type of Jesus Christ. The unnamed kinsman (Hebrew: פלני אלמני, pelōnī ʼālmōnī, or literally, "Mr. So-and-so") who is willing to redeem the land alone but not to redeem Ruth, is a type of any person or institution that human beings think can redeem them, though no one can offer the redemption that Christ offers. Naomi is a type of a believer to whom something bad has happened, and might not understand immediately that what seems a curse today will be a blessing tomorrow. She complains that God has brought her back empty-handed, but fails to recognize that having Ruth for a friend is a tremendous blessing in itself. Her suggestion to Ruth that she make herself romantically attractive to Boaz seems like an attempt to obtain redemption by subterfuge. Ruth rejects the subterfuge and makes a straightforward request. Orpah is a type of one who hears the message of God and turns away from it. Moab is a type of the world, and the Moabite national religion is a type of the belief systems of the world. Ruth is a type of one who hears, believes, and is ready to leave everything with which she is familiar in order to claim the blessings of God. When she leaves her homeland, she also leaves her national religion behind, because only the Israelites had any concept of a God Who was everywhere. She also demonstrates humility, thankfulness, and the ability to recognize a blessing when she receives it. His duty under the Mosaic law required it. Ruth had impressed him, not only with her service to Naomi but also with her willingness to leave her home and family in order to render that service. His comment to her in the winnowing area is further proof: he commends her for asking him to act as redeemer, and keeping herself available for that kind of redemption. Boaz does act out of love, but his is not the common variety of romantic love. The love he shows is a type of the love that Jesus Christ shows to those who believe in Him and trust Him. Ruth probably recognizes this, and this is why she asks him to be her redeemer and not an ordinary lover. ↑ Barton GA, et al., "Ruth, Book of," The Jewish Encyclopedia, 1906. Accessed January 20, 2009. ↑ 2.0 2.1 2.2 "Ruth, Naomi and Boaz: A Story of Loyalty and Love," Women in the Bible, n.d. Accessed January 22, 2009. ↑ 3.0 3.1 3.2 3.3 3.4 3.5 Constable TL, "Notes on Ruth," SonicLight.com, 2009. Accessed January 22, 2009. 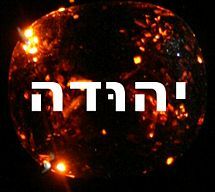 ↑ Levin M, "Ruth," Torah.org, 2005. Accessed January 20, 2009. ↑ Fox B, "The Book of Ruth: A Lesson in Virtues," Mesora.org, n.d. Accessed January 20, 2009. ↑ Gigot, Francis. "Book of Ruth." The Catholic Encyclopedia. Vol. 13. New York: Robert Appleton Company, 1912. Accessed January 22, 2009. ↑ Stevenson J, "Ruth: the Romance of Redemption," Redeemer Bible College, n.d. Accessed January 22, 2009. This page was last modified on 13 December 2009, at 09:00.